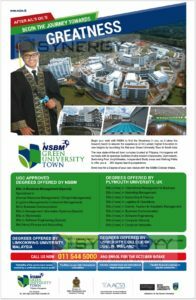 Begin your walk with NSBM to find the Greatness in you, as it takes the forward march to elevate the experience of Sri Lankan Higher Education to new heights by launching the first ever Green University Town in South Asia. The new state-of-the-art town complex located at Pitipana, Homagama will be ready with its spacious facilities of ultra modem Classrooms, Gymnasium, Swimming Pool, Amphitheatre, Independent Study areas and Walking Paths to offer you a 360 degree learning experience. Enrol now for a Degree of your own choice with the NSBM October Intake. G.C.E (A/L) two passes in chemistry and physics in 2016 . Which course is suitable for me ?